→Is It Worth Using Cocoa Butter For Hair Benefits? In our modern, developed world there are so many things you can use to make life easier, thanks to modern technology and discoveries. Hair and skincare is one of those areas, around which a massive industry has grown catering for every possible condition with every possible solution. But sometimes in life the simple things are best. Sometimes it's the original, natural methods that can work best. When it comes to hair health, it's become fashionable in recent times to use various natural butter and oil extracts from plants. Using cocoa butter for hair benefits has become one of those modern solutions that is completely natural and has a long history. The truth is though that Cocoa butter has been used as a skin, hair and health aid for many hundreds of years. The people of South America, where the cocoa tree has grown the thousands of years, are well acquainted with the potential benefits of using cocoa butter. The what's the truth? Is putting cocoa butter on your hair a crazy thing to try, or could it be the answer to slowing hair loss and increasing the health and manageability of the hair you have? Should You Use Cocoa Butter For Your Hair? What Exactly Is Cocoa Butter? Does The Science Back It Up? Cocoa (cacao) butter is derived from the seeds of the cocoa (cacao) fruit. The fruit grows on a tree indigenous to the equatorial forests across South America. Cocoa butter is produced by fermenting the seeds (beans) of the cocoa tree. This is done at a low temperature to retain as many of the original nutrients as possible. These are then roasted and separated to leave a residue that contains around 50% cocoa butter. At room temperature, depending on where you live, cocoa butter will be a soft through to very hard substance. This is important to note as will come back to that later. Cocoa butter has been used for centuries as the base of food products both by the indigenous peoples, and then across the world. What is less well known is that cocoa butter was used, and still is used, by the indigenous people of South America to condition the skin and hair. But how exactly do the properties of cocoa butter make it potentially beneficial for the health of your hair? Well, it's the health of the hair follicles themselves that is important. A healthy hair follicle is open and allows nutrients into the growing hair. A hair follicle that is infected, dry, or not getting nutrients, will pass on less nutrients the hair, and may eventually close up. Closing up can be temporary or it can be permanent. Cocoa butter is antibacterial, which can help with infections. Cocoa butter is also a moisturizer, meaning that the skin will not crack and harden, leading to swollen, malnourished and unhealthy follicles. Cocoa butter is also a natural emollient, a moisturizer, packed with short-chain fatty acids, amino acids, vitamins and minerals, that can nourish both the skin on your scalp, helping with the general health of the follicles. Even just talking about the hair strands themselves, it can soften and moisturize them. This can strengthen the hair shaft, add volume and replenish oils lost due to harsh chemical use in things like modern soap and shampoos. So potentially, cocoa butter can help to strengthen and nourish both the scalp and the hair, bringing a double win. Cocoa butter is actually already added to many professionally produced haircare products. From shampoos, through to hair nourishment products, look at the back of the packaging next time you are in a store and you'll be surprised how often you see it listed as an ingredient. But is this purely because cocoa butter can make your hair soft? Is it also just because it smells nice? Or is it added because it has additional benefits? Well it's definitely softening, and it definitely smells nice, but does any science back up the claims that it can deeply penetrate and benefit both the hair shafts and follicles to bring better hair health? The bottom line is that with many of these ancient but modern hair health remedies, the science can be conflicting or incomplete. That's partly because not much money has historically been invested, unless it's been by big corporations. But as an example of how cocoa butter does have a growing body of scientific evidence supporting the claims, let's take an example study titled “Cocoa Bioactive Compounds: Significance and Potential for the Maintenance of Skin Health”. This 2014 study acknowledges that the cocoa bean has been used for health purposes by indigenous South American people are about 3000 years. On top of that, it also notes potential antioxidant and anti-inflammatory properties in cocoa butter. This is just one example of several studies which acknowledge that cocoa does seem to have benefits for skin health. We've already discussed that the hair follicles are skin, and that the butter itself can enrich the hair, so it appears that science is beginning to agree with indigenous South Americans, and millions of modern women around the world. A lot of people thinking about using cocoa butter for better hair health without using chemicals, wonder whether it's better than shea butter, and are confused about which one they should use. So on the surface they are very similar and you'd be excused for being uncertain about which is best to use. The truth is they are both beneficial, but in slightly different ways. They both absorb well into the skin, they both contain fatty acids, vitamins and nutrients, that's all the same. Where shea butter wins is in its consistency. It's softer and doesn't harden as quickly, making it more versatile. It also contains higher concentrations of vitamins A and E.
Cocoa butter on the other hand wins because it contains something called cocoa mass polyphenol, which has been shown to support the immune system and act as an anti-inflammatory. On top of that, although it's superficial, cocoa butter just smells so much nicer than almost any other type. So the truth is both have very similar properties and both can have the same potential benefits, but cocoa butter has some individual features which make it just as essential as any other type. Perhaps the answer, as we will discuss in a moment, is to mix cocoa butter with other butters and oils to get the best of all worlds. 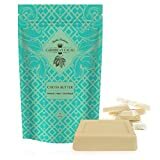 SIMPLY THE BEST: The highest quality, most-loved cocoa butter on Amazon for 5 years running! Over 2200 reviews and a 4.7 star rating put Caribbean Cacao head and shoulders above the rest. There simply is no equal. PREMIUM PRODUCT: Caribbean Cacao Cocoa butter is responsibly grown on a small family farm in the Dominican Republic; Our close relationship with the producers cuts out the middle man and insures you raw, pure, natural, and the highest quality cocoa butter available anywhere. No other Amazon seller can make this claim. ALL IN ONE BEAUTY MIRACLE: Rub in your hand to soften and apply for moisturizing your entire body with a sweet fragrance. Just a dab of our Caribbean Cacao contains the necessary vitamins and minerals to tighten your skin, reduce signs of aging, correct scars and acne, as well as restore skin glow and eliminate stretch marks, eczema, and cellulite. Your perfect daily cleanser! AT HOME BEAUTY PROJECTS - No more expensive cosmetic products; Make your own homemade organic products for the same (if not better!) results - Mix up your own body lotions and creams, face and body cleansers or moisturizers, chapstick, massage oils, body butters and scrubs, hair conditioners, sunscreens and much much more!! Apply cocoa butter to your wounds, itchy bites, or sun burn for the ultimate healing formula for men and women. SATISFACTION GUARANTEE: If you're not completely satisfied with your order, let us know so we can make it right! Your satisfaction is our top priority. As we've already mentioned, your key barrier to using Cocoa butter for hair health experiments is the fact that at room temperature, unless you live in the Sahara desert or somewhere like that, cocoa butter is a solid. On top of that, if you rub it into your hair and then leave it for any significant length of time, eventually it will harden and be very difficult to remove without applying heat, either from hot water or a hair dryer, which can undo the good you have done. If you going to try cocoa butter on its own, then you should melt it gently, either using the friction of your fingers, or preferably gently heating it in a bowl in the microwave. You can then apply at the hands, run it gently through the hair and scalp, and leave it on for about 15 minutes. Keep touching it to see if it's starting to feel a little harder, if it's starting to stiffen at all, then immediately wash it out with warm water and a soft shampoo. These are the "big four" in natural hair scalp health. Put equal measures together in a bowl, microwave them, then whip the solution to lighten it and turn it more creamy. Jojoba Oil For Hair: The Best Kept Hair Growth Secret? You can then use it instantly in the hair as we have previously described. Any excess can be decanted into a container for later use. Because cocoa butter will be mixed with softer butters and oils, it will not retain the same degree of hardness as it will on its own, making it easier to soften in the hands, or with gentle heat, and apply. But however you decide to try it, there is definitely clear evidence that alongside coconut oil, shea butter and jojoba oil, cocoa butter can have potentially positive health benefits for your hair and scalp.